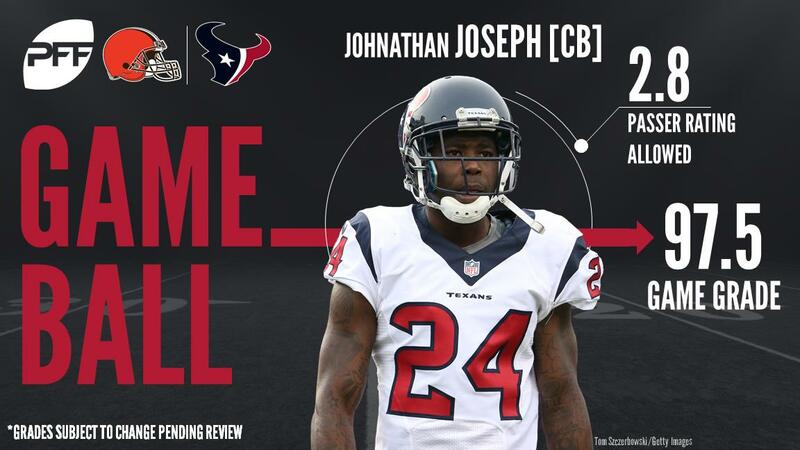 While early on it was a battle of field goals, the Texans would pull away in the first half by scoring a myriad of touchdowns, including two QB Deshaun Watson touchdown passes and an 82-yard interception return by CB Johnathan Joseph. The Texans would lead 24-3 at halftime. In the second half, the Browns would find the endzone twice, as CB Jason McCourty returned an interception for a touchdown and TE Seth DeValve would catch a QB Kevin Hogan touchdown pass, but the Texans had already taken a commanding lead at that point and won the game 33-17. With that, we give you our PFF exclusive takeaways from the contest for each team. Only two catches for Hopkins today but the impact he had when he was around the ball was a major factor in the game. Hopkins’ touchdown came as he got away from Jason McCourty off the line, getting hit in the second window after Deshaun Watson looked off Ibraheim Campbell attempting to rob the quick throw to the endzone. However Hopkins’ biggest impact on the game may have been turning defensive back for a play, with Watson scrambling to the left flat he inexplicably threw a ball directly to McCourty who was standing in front of Hopkins, who reached through to break up a sure interception that would have setup the Browns in scoring range. Griffin tied for the team lead with three receptions today and the Browns gave up those plays with concerning ease over the middle of the field. Working from the backfield and inline, the Browns’ linebackers couldn’t get a handle on Griffin, giving up easy quick conversions to nullify the Browns’ pass-rush. Griffin’s work kept the Texans’ offense ticking without stressing the Texans’ offensive line in pass protection. Griffin’s 2.48 yards per route run is the second highest mark of the week thus far. While some of the plays came gift-wrapped, Jonathan Joseph put on a coverage clinic against the Browns. He allowed only 6 yards and two catches on six targets, flashing great transition to shut down passes underneath. Joseph’s closing speed is special, and he used it to great effect Sunday, registering an additional two picks and a pass deflection. Jackson paired with Joseph perfectly, showing similar aggression around the line of scrimmage. He set the tone to open the game, driving into the backfield to shut down Crowell in the behind the line of scrimmage on the Browns’ second offensive snap. In coverage, he illustrated tight coverage on a consistent basis, allowing only 27 yards on 4 targets. The Browns’ have seen some pretty atrocious performances at the quarterback position, but Hogan’s first career start plumbed new depths. He threw three interceptions, lost a fumble and spiked the ball in his own endzone for a safety. Hogan managed a passer rating of only 44.0 without pressure against the Texans, showing wild accuracy throughout the entirety of the contest. Hue Jackson has proved capable of elevating the performance of signal-callers, Hogan is his most difficult project yet. The Browns’ most effective offensive strategy entirely revolves around free agent guard Kevin Zeitler. He has the strength to carve big lanes with crushing double teams on power, and the athleticism to cutoff pursuing linebackers on outside zone. Zeitler was also the only Brown serviceable in pass protection, managing a perfect game on 48 pass-blocking snaps. Unlike the rest of the unit, Zeitler adapted to the Texans’ frequent stunts up front. Garrett stepped up in playing time, getting 33 snaps this week compared to 19 last week, and he stepped up his production to go with it. Just the one sack this week after a pair last week, but he racked up seven total pressures and added a pair of stops in the run game as well. Garrett showed well with greater exposure to the run game (14 run-defense snaps compared to 4 last week). Even greater playing time is surely just around the corner. Shelton has been hot and cold in terms of production this season, but this week was another up-tick. 10 of Shelton’s 11 stops this season have come in two game against Indianapolis and Houston. He matched his season high with 5 stops today, getting the better of the Texans’ interior offensive line after being shutout last week by the Jets.